I attended the Vox Unconference, the World Heath Care Congress and a pharmacy summit this spring. There was one topic that overlapped the three events--the opioid crisis. It's all over the news, but so frightening, I think it bears mentioning here. Here are some things you need to know--especially if you're a parent. 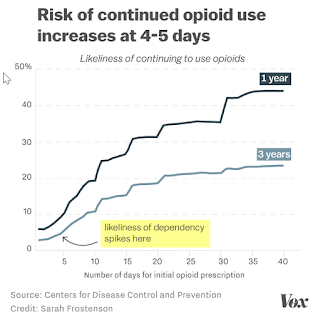 The risk of continued opioid use increases after 4 to 5 days. If there is a history of addiction in your family, even that amount of time may not be worth the risk. Opioids are not effective for treating chronic pain. They may work for a month or so, but the effect is likely to diminish even at increased dosages. Eventually, you'll be left with your chronic pain and a drug dependency. Some people even experience hyperalgesia, a greater sensitivity to pain after taking narcotics for longer periods of time. How pain came to be the fifth vital sign. The New Yorker ran through a good history in Who is Responsible for the Pain-Pill Epidemic. Vox reported, "US doctors wanted to treat pain as a serious medical problem. But when pharmaceutical companies pushed opioid painkillers with a misleading marketing campaign, they started a drug crisis." 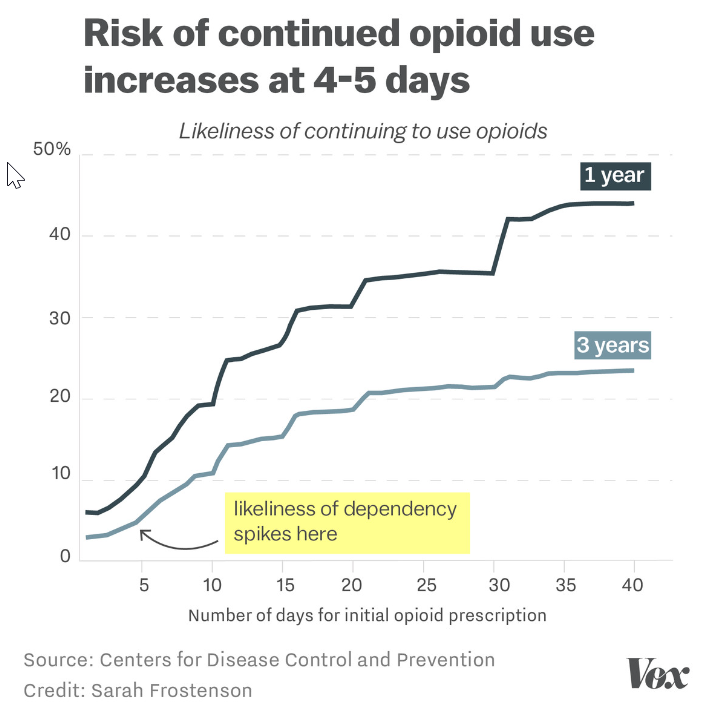 Vox did a really great story on the crisis: How the opioid epidemic became America’s worst drug crisis ever, in 15 maps and charts. Please take a few minutes to scroll through it and watch the 4 minute video. There is tons of good information available. Here are some recommendations if you want to explore this topic in greater detail.